The objective is to create alternative housing forms currently not available on Bowen Island to address the growing needs of a diverse population. We propose to do that at Parkview Slopes and Seymour Landing by way of age- and income-oriented designs and appropriate price levels for young families, small or single households, seniors, and other households with special needs. A meaningful part of this objective will already be accomplished by the development and construction of the 55 non-market housing units on Parkview Slopes (30 rental units + 25 units on long-term land lease lots) and the 40 to 80 units at Seymour Landing for independent/supportive living. Further, a large number of the “market housing units” in both projects will consist of housing forms currently not available on Bowen Island, i.e. attached homes, townhomes, low-rise condominiums, and houses with designs best suited for particular age groups and needs groups, i.e. young families, single person households, and seniors. By way of contributions from a developer as part of an amenity zoning (i.e. 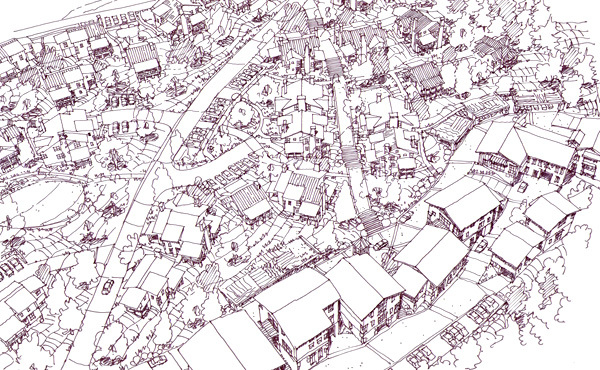 the provision of non-market housing in return for higher market density). In general, a developer will not be able (or willing) to provide alternative, “non-market” housing without being assured of the project’s financial viability. Such viability depends primarily on the cost of development and construction, the time of absorption (i.e., how long it takes to sell the finished product), and the price for which the market product can be sold (or not), or the rent/lease rate for the “non-market” unit (which need to cover the costs of financing, amortization, maintenance, operation and management, etc.). In other words, a developer will only be able and willing to provide “non-market” housing as long as sufficient financial returns can be expected from “market” housing or other sources to secure the funding for construction of “non-market” housing. The rezoning proposals are intended to provide impetus and assistance towards the creation of a sustainable local economy with emphasis on arts, culture, education, life-long learning, tourism, hospitality, elder care, and the maintenance of health. The proposal for Seymour Landing includes an expanded inn, an independent/supportive living community, and a retreat campus (all three of those uses require services for meals, housekeeping, laundry, administration, shuttle service). The proposal for Parkview Slopes includes live/work spaces for trades, artisans, self-storage, and small businesses to manufacture, assemble, store, and display finished and unfinished products. Further particulars about this subject will follow as time permits. The proposed developments of Parkview Slopes and Seymour Landing represent “textbook examples” for the implementation of Principle 1. Snug Cove and its periphery have evolved over the last three decades as the island’s core of commercial, educational, cultural, and residential activity with the closest access to the island’s transportation nodes directly at the entrance to Bowen Island. Much of the infrastructure needed to serve the proposed uses at Parkview Slopes — be it roads, water lines, sewer lines, hydro service, stormwater systems, or trails — is already in place directly at the periphery of the proposed development. We will provide the funding for the development of Parkview Slopes, i.e. internal roads, byways, water lines and services, sanitary sewer, storm sewer, hydro/tel services, etc., and all construction of the proposed non-market housing. Cowan Point is an existing development with a complete (but under-utilized) infrastructure already in place and close to the proposed development, i.e., community water system, community sewer system, storm water system, hydro, telephone, cable, roads, trails, extensive environmental covenants, public parks, public golf course, etc. Apart from the fact that most of the needed infrastructure is already in place for both projects, equally important is the need for costs of ongoing operation and eventual replacement of infrastructure to be shared by the largest number of users acceptable. Not to follow that principle will lead to the waste of precious resources and capital, and will burden a small number of users with high costs because of the inefficient use of existing infrastructure.